Yesterday we started eating the Shark’s Fin Melon shown in the picture above, in order to harvest the seeds to bring to the Seed Swap at the Eco Fair in Drefach Felindre on Saturday 23rd March. The seed originally came to us via a seed swap in Sheffield. We grew it for the first time last year and, despite the poor growing season, managed to get one fruit to maturity. After this plants are hardened off then grown on as for pumpkins. Fruits are harvested before the first frost, once the skin has hardened and the fruit sounds hollow when tapped. Once ripened, the fruits store exceptionally well. Ours was harvested at the end of last summer and has stored very happily throughout the winter hanging in a net sack from the beams in our house. In “Seed to Seed” by Susan Ashworth it is said that the fruits can store for up to three years! 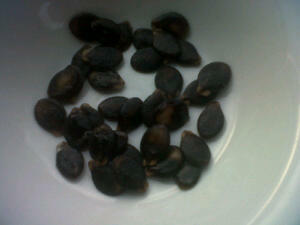 The seeds are unusual for a squash / melon, being black in colour with a slightly serrated edge – see the picture below. The Heritage Seed Library advises that seed continues to mature inside the fruit for several months, so seed for planting should not be removed from the fruits too early. Seeds of the Shark’s Fin Melon will be available at the seed swap, along with many other interesting and more common or garden varieties of seed! Do come along for a look if you are in the area. If you do not have seed to swap you can leave a donation instead, with all proceeds going to the Heritage Seed Library. We will also have a scythe stand and more information about activities, events and courses at the Trust. 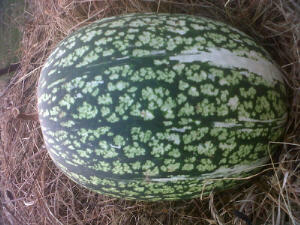 This entry was posted in Events, Seed Saving and tagged heritage seed, seed swap, shark's fin melon. Bookmark the permalink.